The film is an absolute classic! 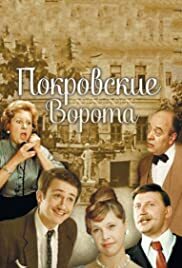 One of the best Soviet comedies. Zorin wrote a wonderful play, based on his life as a student in Moscow in the 50's. Kazakov made a superb film out of it. In a way it's their Declaration of love: to Moscow, post-war Moscow and Muscovites, and to the days when they were young and in love. Besides the plot, the cast forms a beautiful ensemble, where even the smallest roles get stuck in one's head immediately (e.g. Rimma Markova or Elisaveta Nikishchikhina). Have no clue, how would it be to watch this film in translation, but for anyone who knows Russian almost every line the characters say is an absolute masterpiece: laconic, acute, hilarious. The film is an absolute classic!